Custom shaped Matte Die Cut Stickers were on site in Los Angeles at the Moog House Of Electronicus, an electronic pop-up and synth guided exploration of the power of sound. Visitors to the historic Kim Sing Theater in Chinatown had the opportunity to get their hands on Moog synths (including the new polyphonic Moog One), and explore a magical sonic experience through interactive sculptural synthesis installations, an immersive audio visualization system, and daily synthesizer workshops led by synthesist Bana Haffar. These hour-long workshops gave participants the chance to use the Moog DFAM Percussion Synthesizer as an interactive learning tool to break down real-world sounds into their fundamental sonic components. The Moog House of Electronicus is inspired by the Moog Island Of Electronicus, which was an experimental gathering on the American barrier island of Tierre Verde during the 1970s that was a synthesized celebration of peace and love. It was "an electronic happening designed to unite mind, body, and soul in a creative explosion of thought and feeling." For those not familiar with the Moog as an instrument, it was developed by Robert Moog in the mid-1960s when he was a doctoral student at Cornell University. The Moog is now a legendary sound in popular music, with Pink Floyd's "Wish You Were Here" and Parliament's "Flash Light" as notable examples in the pantheon of Moog Essential Listening. Back in 2012, Google celebrated Moog's 78th birthday with their Daily Google Doodle. Though Moog passed away in 2005, his influence on sonic experimentation continues to this day as artists find his sound and make it their own. 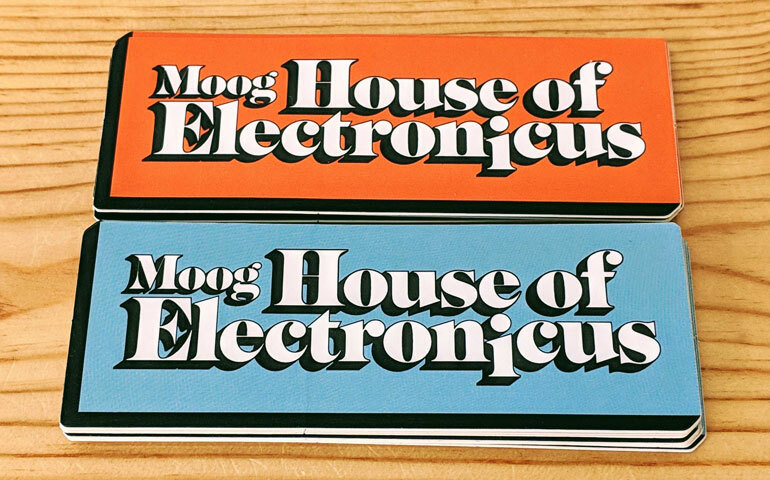 To commemorate this event, the team at Moog ordered up a few colors of these 1.5-inch tall by 4-inch wide matte finished die cut stickers with the retro font calling out the Moog House of Electronicus event name. There's a black stripe along the left edge that runs down to the bottom that matches the branding of their website and overall aesthetic. For those who visited the House of Electronicus, the memories of this musical playground will last long after the event is over with these rocking stickers.